If you've got a Mustang, you probably bought it because there's not a lot else on the road that's quite like a Mustang. Of course, being enthusiasts, we like driving fast - and a low-slung profile. Unfortunately, the factory suspension of nearly every S197 Mustang - outside of a few Roush models and the Laguna Seca - need some suspension work to sit right and actually handle well. And just lowering the car doesn't fix the problem - if you drop the car without the right supporting modifications, the car's rear end will wander all over the place and your rear end's traction will be anything but surefooted. From the factory, the car suffers from brake hop and wheel hop and the rear end has an awful tendency to wander - handling really hasn't been a priority on the Mustang since 1971 when Ford stopped caring about the SCCA Trans Am series. The following upgrades will help your Mustang sit lower for a more aggressive stance (as in the Musclecar sense, not 40*-of-negative-camber "stance") and better handling performance. Mind you, the type of setup we're looking at here is ideal for street use- Track-Day Suspension for Mustang will be coming soon in a separate feature. From the factory, most Mustangs have enough wheel gap to be a 4x4 - that's less than desirable for handling and leaves a lot of potential for body roll. You can clean up the wheel gap by dropping the car a few inches with either a set of Lowering Springs or a set of Coilovers. If you're on a budget or want a milder drop, a set of Lowering Springs or Sport Springs will give you the drop you're looking for as well as improve your handling. Eibach's Sportline Lowering Springs are an incredibly popular option, but Hotchkis Sport Coil Springsare also a great choice. If you're after a more aggressive drop, want a greater improvement in handling or just something better than springs, coilovers are the way to go. 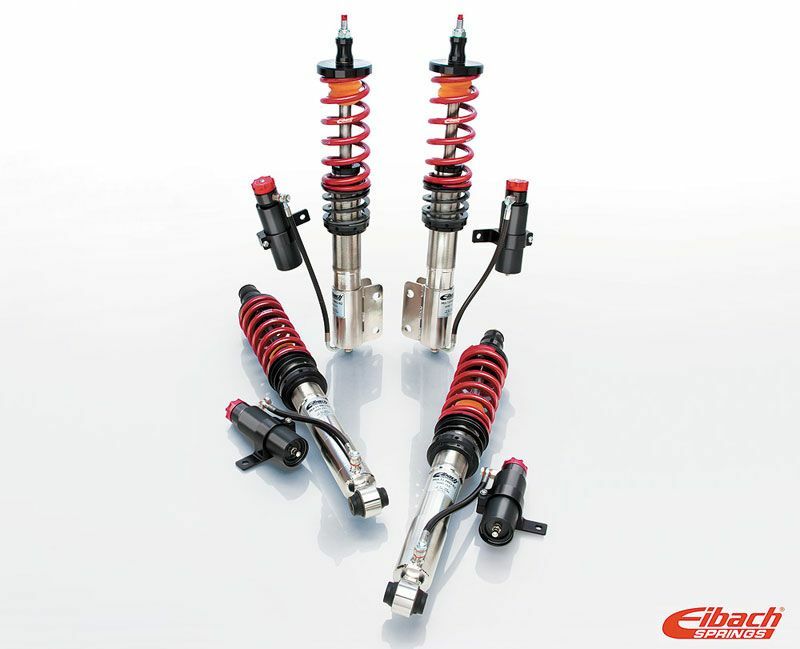 Eibach Street, R1 and R2 Coiloversare very popular choices for those opting for coilovers, but there are many choices available including options from BC Racing, KW Suspension, ST Suspension and Vogtland. Not sure which springs are best for the ride you're after? You can always ask one of ModBargains' Ford Modification Experts. Lowering Springs Eibach Sportline Lowering Springs - Front Drop: 1.4" | Rear Drop: 1.5"
Hotchkis Sport Coil Springs - Front Drop: 1.1" | Rear Drop: 1.6"
Named for the French Panhard company that invented it in the 1890's rather than any sort of function, the Panhard bar (aka panhard rod) is designed to limit lateral movement. The height of the panhard bar determines the height of the rear roll center - the roll center being an imaginary point around which the racecar "rolls". Here's the thing, when you lower a car, the suspension needs to be adjusted to compensate - when you lower the panhard bar, the rear roll center drops, which tightens cornering handling by promoting side-bite. By keeping the axle from wandering around, your stability is improved. A Whiteline Panhard Rodis a great way to keep your rear axle centered. A Watt's Linkage does the same thing - it's almost like two panhard rods facing each other - both methods are designed to prevent sideways motion of the axle relative to the car. 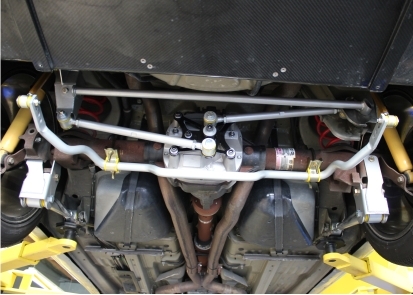 Like a panhard bar on steroids,Popular in Australia's V8 Supercars racing series, the Watt's Linkage creates even lateral transfer, enhancing rear end stability. 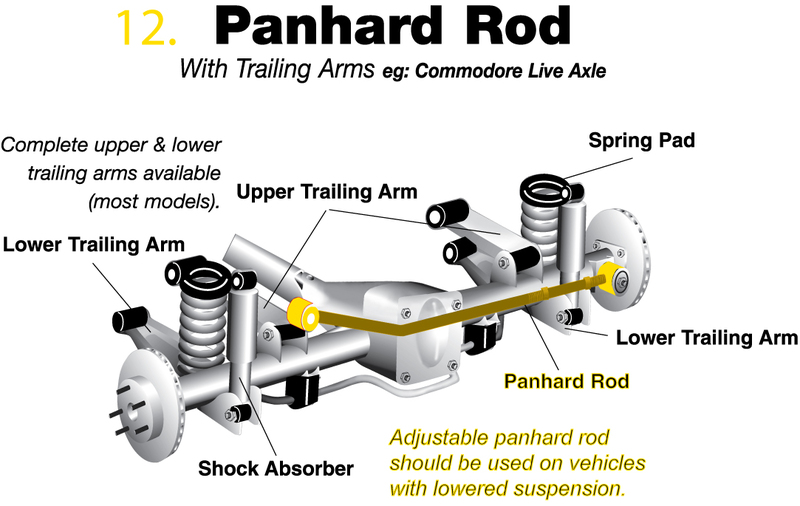 While more expensive than a panhard bar, it's the superior method of keeping your axle centered. 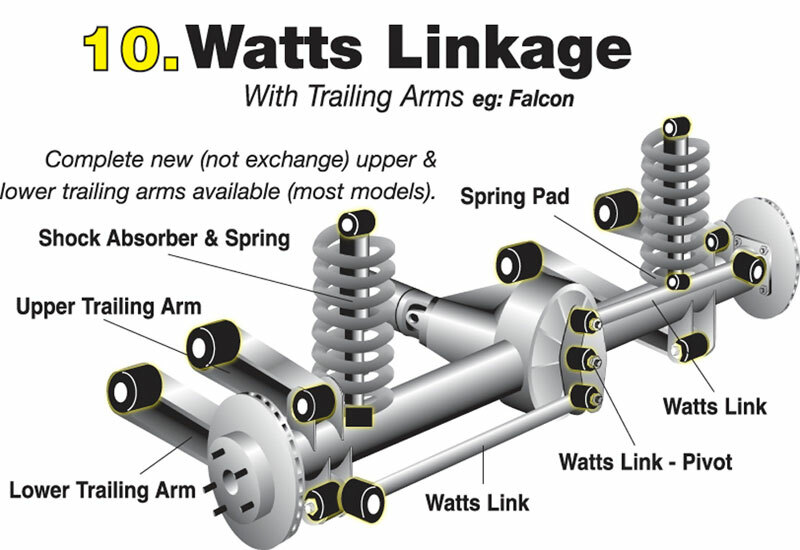 Whiteline offers a complete Watts Linkage for the Mustangthat's integrated cleanly into the diff cover - this upgrade alone will do wonders for your rear end stability. Wheel Hop is a BIG issue for Mustangs - for stock vehicles and even with modified suspension - it'll continue to be a problem without replacing the upper and lower rear control arms to correct the rear end's geometry. It's worth noting that unfortunately, the improvement in handling comes at a cost - you will probably experience increased noise, vibration and harshness with these - but the thing to consider is that the OEM bushings are softer than a baby's bottom and have all kind of give, allowing a ton of unwanted movement in the suspension's geometry. Once your Pony is prancing low, then Rear Control Arm Relocation Brackets are a must have. The lowered stance of the car skews the rear suspension geometry, leading to poor acceleration and wheel hop. By relocating the rear control arms, rear squat is improved, rear-dive under acceleration is drastically reduced and traction is enhanced. By combining the upgrades listed above, you'll have a lowered Mustang that will handle better than stock and let you really enjoy every curve the road can throw at you. Modifying your suspension will make every drive that much more rewarding and allow you to push into that corner harder. These upgrades are a general guide, and should you have any questions about the suspension or aren't sure what the best suspension option for your build goals might be, you can always ask one of the Modification Experts here at ModBargains via online Chat at ModBargains.com or by simply calling 714-582-3330. Thanks for reading, and we hope this has given you a better idea how to get the most out of your Mustang's suspension.